While there are great resources around the Internet for finding apps, you don’t always have the time to go reading through reviews and such. 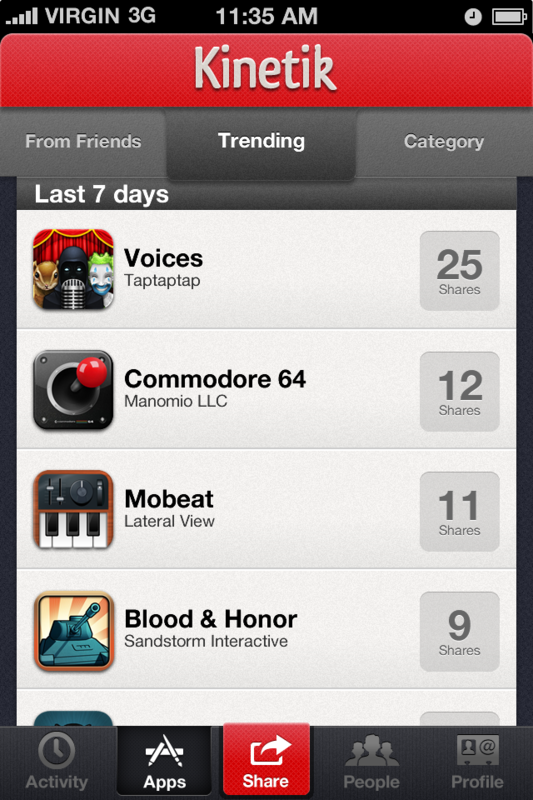 We’ve all dug through the App Store for what seems like hours on end only to come up with…not much. 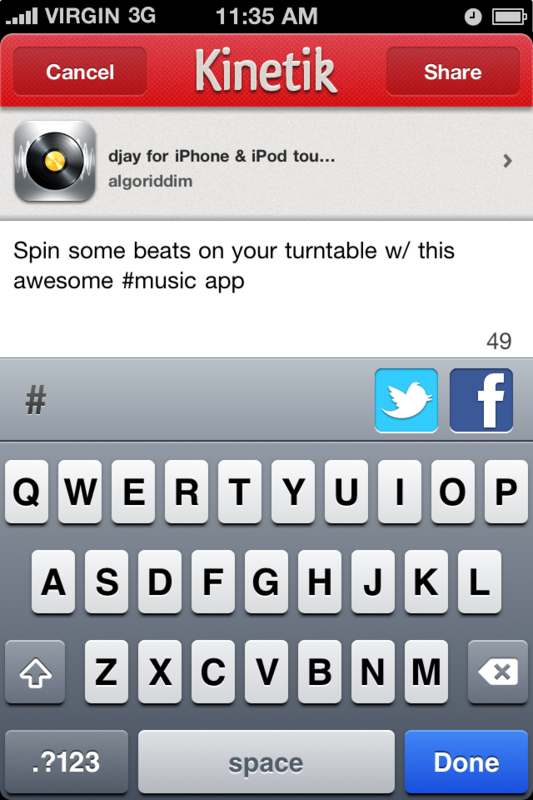 So what if there was a better way to find apps for your iPhone? Kinetik wants to be just that. 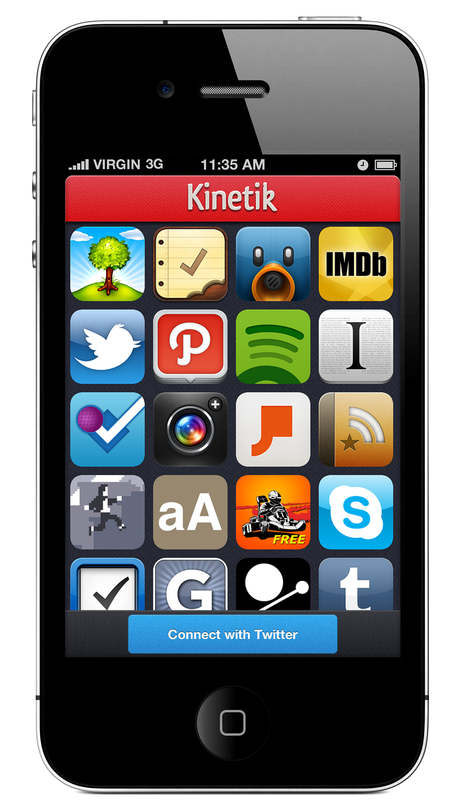 Kinetik is an iPhone app that will help you to find iPhone apps. Seem like a bit of recursion? That’s sort of the point. If you could rely on your friends to give you suggestions, or maybe get a designer to show you the most beautiful apps, wouldn’t that be better than the more hit-or-miss methods that you’re probably using now? 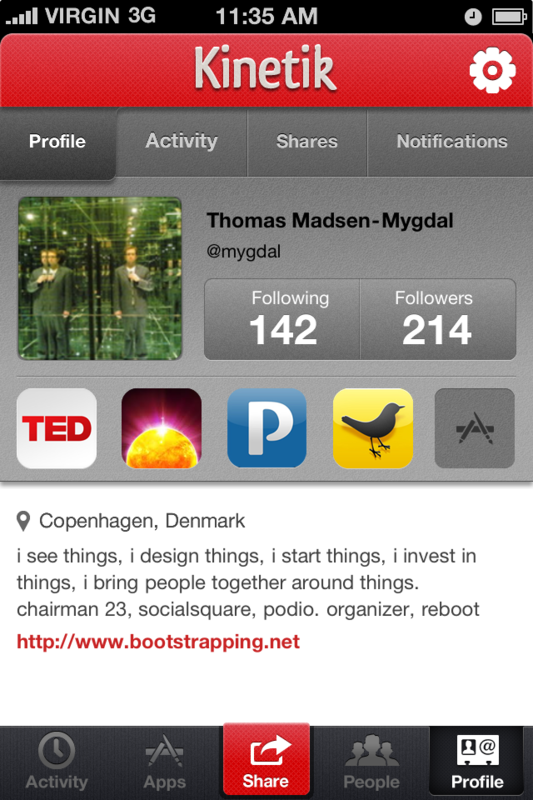 Or how about if you could share the apps that you love, and tell exactly why you love them? 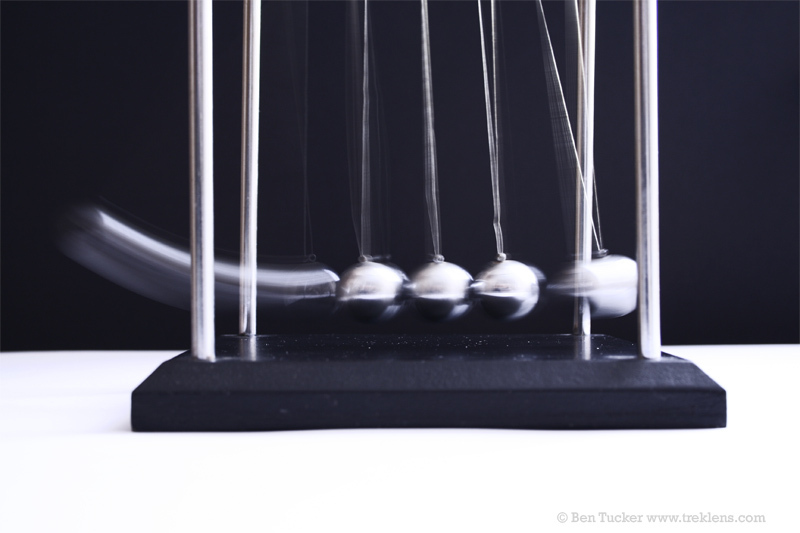 That’s how Kinetik works. Just load up Kinetik, choose an app that you have downloaded and then you can leave a comment about the app then share it to Twitter and Facebook. 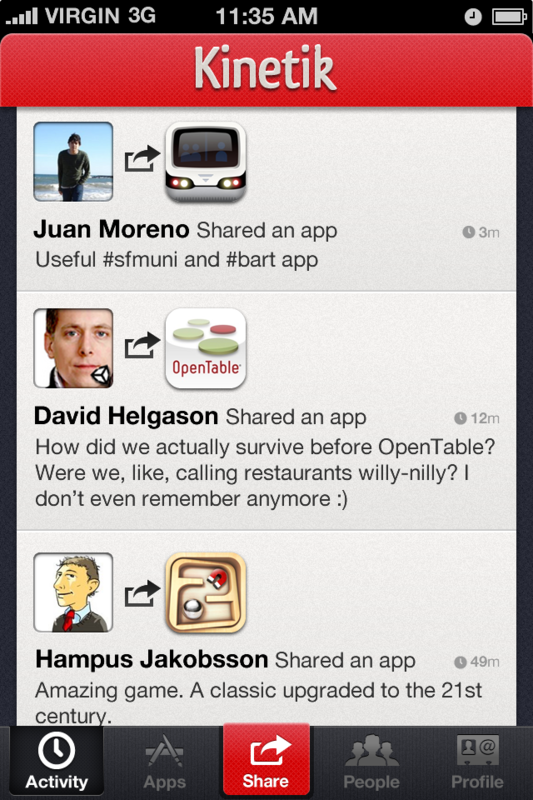 As you add friends via your social networks and inside of the app itself, you can see recommendations that your friends have made too. 15 billion apps have been downloaded to date. There are over 400,000 available and finding the best ones is becoming harder every day. But when you can rely on your friends, on the network that you’ve built, then it’s a whole new world of social discovery. Kinetik isn’t without competition. There are great offerings already on the market such as websites like AppShopper, and even more direct competition from the biggest name in the game, AppsFire. But when it comes to finding apps and sharing them with others, it might very well be a situation of the more, the merrier. So give Kinetik a try. It’s free and you can download it now for your iPhone. It will be interesting to see exactly what the Kinetik team does with all of the data that they can see flowing through the app, but they need your input to gather that information. 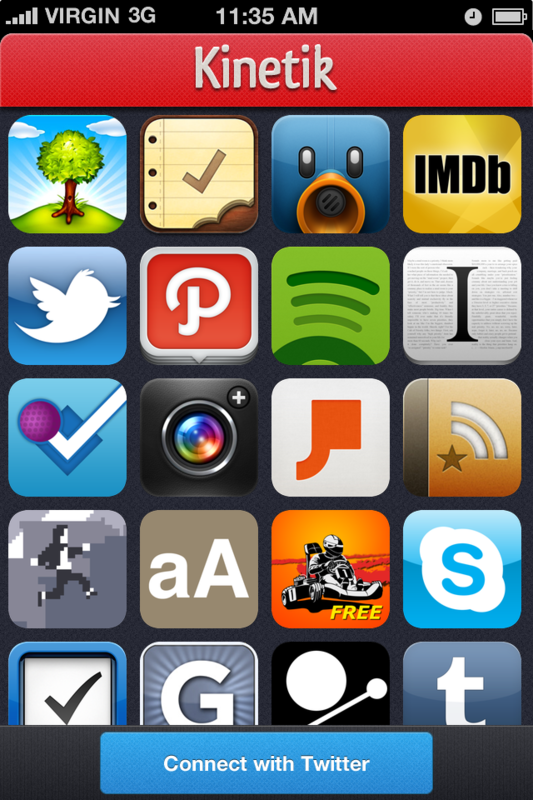 I’ve tried loads of different ways to find new apps. While I’m privileged enough to see the best of the best come through The Next Web, I can tell you that Kinetik is one of the best ways I’ve found yet. I’ve had the chance to play with it for the past couple of weeks while it was in beta and it’s slick, useful and really quite fun. Give it a download and let me know your thoughts.